Statistical information from Guiding the Gifted Child, 2002. The mean, or average, IQ is 100. Standard deviations, in most cases, are 15 points. The majority of the population, 68.26%, falls within one standard deviation of the mean (IQ 85-115). This is the intellectual ability range addressed by the standard school age/grade-based curriculum. 13.59% of the population is between the first and second standard deviation below the mean (IQ 70-85), and 13.59% is between the first and second standard deviation above the mean (IQ 115-130). Students on both sides of the curve require a modification to the curriculum from that provided to mainstream students to address their needs. 2.14% of the population is between the second and third standard deviation below the mean (IQ 55-70), and 2.14% is between the second and third standard deviation above the mean (IQ 130-145). These exceptional students on both sides of the curve require an individualized curriculum to address their individual needs. 0.13% of the population is more than three standard deviations below the mean (IQ <55), and 0.13% of the population is more than three standard deviations above the mean (IQ 145-160). Thus, 13 out of 10,000 individuals score above 145 and are considered profoundly gifted. These students on both sides of the curve are very exceptional and require individualized accommodations to address their needs. 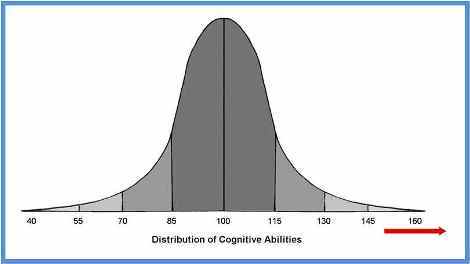 Approximately, one out of 30,000 individuals (.003%) is more than four standard deviations above the mean (IQ >160). These students with an IQ of 160 and above require extremely exceptional educational accommodations to meet their needs. Established in 1988 and reauthorized in the 2015 Every Student Succeeds Act (ESSA), the Jacob Javits Gifted Education Program remains the only federal program focused on gifted education, with $12 million included in the Fiscal Year 2017 budget. The Javits program funds applied or classroom-based research to help develop effective strategies for identifying and serving high-potential students from populations that have historically been underrepresented in gifted education. This Javits-funded research has yielded valid and reliable ways to identify gifted students from underserved populations, fair and equitable observation tools for identifying gifted and talented English Language Learners and strategies to help teachers improve the academic performances of high-potential black and Hispanic students as well as those with disabilities and from low-income families. At the state policy level, many states have no laws mandating gifted education and, of those with mandates, many have no available funding for gifted education. Thus, gifted education practices can vary by district and by school. For a current list of state policies and funding, visit the Davidson State Policy Database.